Status: Fully restored. For sale. The 6'2" Steinway XR model has the string scale of Steinway's most popular grand, the 5'7" Steinway model M, but built into a case 7 inches longer to hold the Aeolian Duo-Art reproducing player action. The Duo-Art was introduced in 1916, and the design evolved significantly during the peak production years of the 1920s. 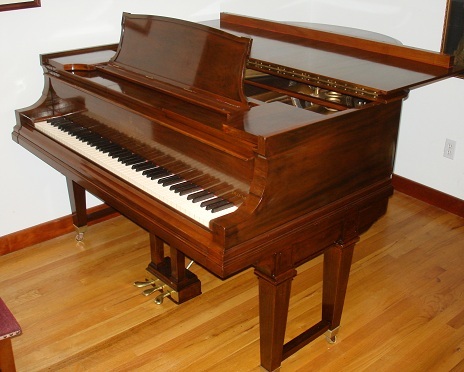 This instrument has a single 1920 Steinway serial number stamped on many case and action parts, but it has an unusual mixture of both early and late player design details including some that were only standard after about 1926. And there are no obvious "ghosts" such as extra screw holes to suggest that the Duo-Art player was ever the typical version common in 1920. So is it possible that this instrument was either an early prototype of some later design features, or was factory upgraded some years after 1920, or was held by Aeolian for some time before being first fitted with the player using a mixture of newer and older parts. A new Steinway XR in the 1920s cost a small fortune of about $7,000 during a time when the median house price in the United States was less than $2,000, and an average professional worker or family farm had an income of less than $1,000 per year. So by some measures, the equivalent "new" price in 2012 would be somewhere around $300,000 - $500,000 (about 7 times a median yearly salary of about $40,000, or 3.5 times the cost of an average $150,000 house.) They were definitely playthings of the very wealthy. This instrument came to Historic Pianos in pieces, in the precarious position of having been dismantled for rebuilding in the 1990's and then abandoned. The action was also partly disassembled with a few missing parts, although the original Steinway hammers were still resilient and in near-new condition with very little wear. The metal hardware, hinges, and hundreds of screws of all sizes were simply combined in a single coffee can. The piano and player had been previously rebuilt 40 years ago using inferior quality tubing and pneumatic cloth. The player was in very poor non-operating condition with heavily damaged and degraded fabric and tubing. The mahogany case was obscured with an unattractive, opaque stain/finish combination that resembled brown paint. The stringplate had been stripped and left unfinished, and the brass agraffes were black with corrosion. Although the soundboard and bridges were black and dirty, they were in fundamentally excellent condition with no cracks or damage, and with excellent soundboard crown. Restoration was carried out in two stages at Historic Pianos. The first stage in 2009 and 2010 brought the instrument and player back to basic playing condition so that the tone, touch and player function could be better evaluated, while the final stage in late 2012 included the final French-polish case finish, final hammer voicing and action regulation, and final restoration of pneumatic player components that were not rebuilt in the first stage, along with fine-adjustment of the player performance. Some people assume that Duo-Art players necessarily have stiffer action response or heavier touchweight compared to non-players. While it may be common for poorly-rebuilt Duo-Arts to suffer from heavy touch or sluggish response, this particular instrument proves that a properly restored Duo-Art player can have exceptionally good touch. The dominant contributor to action inertia is hammer mass, and this instrument with the original large but lightweight Steinway hammers avoids the common problems of many rebuilt instruments with inappropriate modern replacement hammers that are far too dense and heavy. While the key levers of a model XR Duo-Art are longer than in an Ampico or non-player of the same scale length, the longer key levers do not increase the action inertia because they are actualy lighter than the key levers of shorter instruments. The reason is that the balance point of the longer Duo-Art keys is shifted to be similar to that of a longer concert grand, requiring much less lead weight in each key lever to achieve the proper action balance. During this restoration, the inertial balance of each key, hammer, and action component was measured and fine-adjusted for uniformity, allowing either a human player or the Duo-Art to more easily control the loudness of each note. As can be heard in the linked videos, the expression of this instrument is superb, reproducing original roll performances with high fidelity. And most human players who have played this instrument prefer the XR Duo-Art touch to a standard Steinway model M.